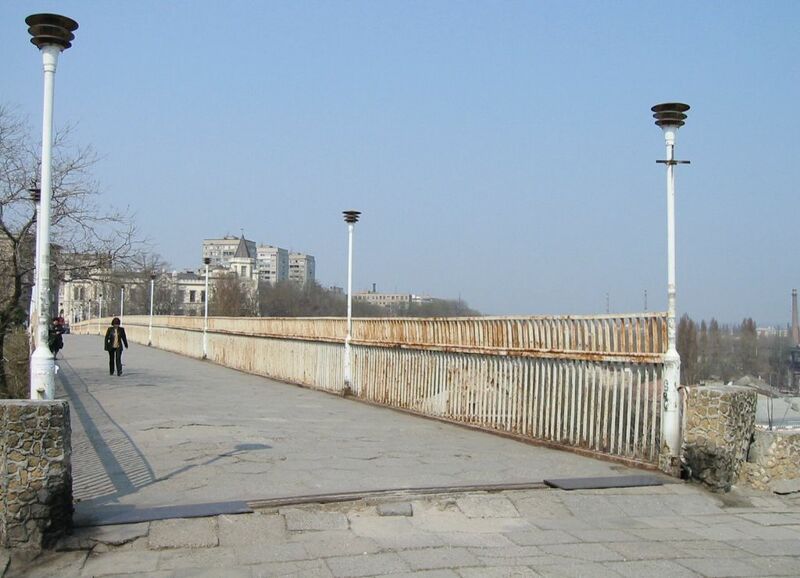 The pedestrian (originally built as suitable for cars too) bridge joins Primorskiy Boulevard and Jvanetskovo Boulevard. There are two palaces there: Vorontsov’s Palace and Shah’s Palace on the other side. The bridge was built over Jeanne Labourbe Descent (Voennyy Descent both now and originally) in 1968 by architect A.Vladimirskaya and engineer Kiriyenko. They tried to finish it by the 50th anniversary of the Revolution but failed to do so. The bridge was ordered by a Soviet communist party official, the first secretary of the regional party committee in Odessa named Mihail Sinitsa. It is the longest, tallest and narrowest bridge in Odessa. Its formal name was Komsomolskiy but the bridge was never known by this name. Later it was reamed to Kapitanskiy. Yet nowadays very few people have heard of those names. As for the current (informal) name, there is a legend behind it. They say that Mr. Sinitsa loved his mother’s-in-law pancakes but she lived on the other side of the ravine, and he did not like to walk around for the lunch break every day, so he ordered the bridge to be built. Yet in the reality his mother-in-law lived elsewhere, so he could get to her faster if he avoided the bridge at all. On the other hand, he was the mayor then and has something to do with the bridge coming into being, that cannot be denied. And an Odessite’s mother-in-law is often more important than the wife! Another version has it that men tormented by their mothers-in-law would commit suicide by jumping off this bridge. Joking aside, the tall railing were installed a couple of years after the opening of the bridge, ostensibly after some suicide attempts (not clear whether successful or not). However, no attempts have been registered over the last decades. The bridge has a feature. It is very tall and if you stand still you may feel it rocking especially when there is a strong wind. And if several people jump together in sync you cannot but feel the swing. Again, back to the bridge name: some people say that the bridge is as loose as a mother’s-in-law tongue. Young people like to put locks on the railings. It is a silly tradition imported from Europe, presumably from Czechia a couple of years ago, approximately in 2006. This custom symbolizes solid relationship that is locked (the key is supposed to be thrown into water). According to estimates, there are about 10,000 locks on the bridge. A lock weighs about a pound, so they make up a significant load. It is notable that the bridge is a small copy of Grand Duchess Scharlotte Bridge built in Luxembourg in 1965. A view from Vorontsov’s Palace. No locks yet. 2003. A view from the Old Odessa open air museum. 2013.